The CSI module tag indicator could be a module that indicated whether or not a tag is present for a page for example if a thread is closed there could be an image indicating this. But it can also be used to easely place an image (with or without link) on a page. to be cool, the image needs to be transparent on the edges, only PNG and GIF file formats can do this. your page NEEDS to have the right tag of course. Great! - That IS great! Thanks Steven for the idea! I saw this first time now in the snippets ( CSI…) and wonder what is this stamp telling me (it was the "TAG" in the short text). A very good idea to promote a new idea! I saw, I think it was Leiger who had made a "thank you" CSI … more for fun but hey,… maybe people like it and want to use it. You had appended /edit/true to that "thank you" link, which is a bit pointless when I'm the only one with editing rights! :) Have fixed your post. I don't like advertising. And if one person starts putting ads for their work up on a site, why not everyone? There is not enough space here for everyone's ego, and therefore there should be no ego at all. You can use it to get attention to something. It can be as simple as indicating that the thread is closed… Or that there is a new version or… what ever. I admit, and I say so in the upper comments that posting it on different sites (wich are not mine) was wrong. So there is no need to bring this CSI down, by telling that it's only use is to support sombody's ego. BTW I was supporting the ego of CSI, wich I think is a cool tool and a way to get massive amount of home-made-tools at our fingertips… but of course we need people to know that CSI's exist and we need people to make them. So giving examples and getting attention to them was I my opinion not such an imposing idea. 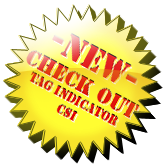 If the "Progress tracker CSI" and the "Analog Clock" can post an example on that page then the "tag indicator" should also be allowed to put an example on his page. I disagree with posting it on threads and pages that seemingly do not have any direct link back to the CSI. And… I feel that something like the "analog clock" is more acceptable for one reason — it's in-line. The CSI is fine, nice work, but flashy banners on important pages are not. What annoyed me was the need to explain this, it seems obvious: every site has owners, who look after it, and users, who use it. The users should be careful to stay away from structure, except after careful discussion with the owners. This is basic. Let me give an example, you go to Wikipedia's front page and add your latest own article. Result: you will be banned and your article deleted. "Wiki" does not mean "no rules". You can put an example on the CSI package page itself, yes, that makes sense. I've already explained why I don't like using hidden tags for this, because hidden tags are structural. Like _templates, they site in site owner space. I don't like seeing strange special tags appearing on the front page of packages. Do you see why? This is cristal clear to me… I apologised for this and it was set right more than a week ago. I find it sad not to have some other [[conditional]]-tool to do cool programming tricks with, but up till now TAG's are the only one. So I use them by lack of other. There is no need to make the tag hidden, but if you wish it will not popup on your tag-cloud… there is no other way to filter it… so that's why I used hidden tags. If someone intends to use the CSI tag indicator for only one page… then it is stupid to use the tags… but that was not the idea from where it came… it was to indicate certain things belonging to a certain category of pages (like _closed). If you are reffering to the time that the tag indicator was on the homepage of the projectsforum… I already apologised for that… hopefully we can leave it behind us… in the case of "I don't like seeing strange special tags appearing"… what is the use of the tag that fills up after "From the desk of…via the…"… it's not hidden, I know, but what is the extra value of the tag if it's a joke in context? Steven, my apologies, I was not re-criticizing you, but recapping my original point of view for the benefit of others. I didn't mean to sound critical. With respect to the tags, what I do on my blog is my business, what happens here is shared by everyone. The blog tags aren't hidden, either. Hidden tags, especially on sites like this, have specific functionality (_closed, _task) and it's not up to users of the site to extend that. It's an admin function. Do you see? This is an important and interesting discussion because it is about borders between what we can do, with different roles on different sites. It's like person A posting a new entry on person's B blog. This could easely be done by not accepting "_tags" from not admins OR to be positive by only accepting "_tags" from admins. But this would not need to be, if there was some other way for programming inside wikidot with wikidot syntax. So there is still much work to be done I think. Most people will go as far as not forbidden. So yes I maybe walked across the border. Put up a fence.